We offer a variety of customized services for small businesses, educational institutions, government agencies, law enforcement agencies, museums and non-profit organizations. We can digitally re-master your video tapes, photographs, presentations and important documents to high quality, long lasting, DVDs, providing you easy access and retrieval. The DVD menu structure allows for interactive content for intro videos before the menu, subtitles, instant chapter access, narrated slideshows, multiple language support for audio and subtitles, random segment playback for video loops, and interactive presentations. Our experienced team can create professional solutions including: custom control, web and email links, subtitles, and even copy protection, giving your final product the polished touch. We like to believe that we are unique in our beliefs of superb quality at low prices, providing you with the best value. We feel that we shouldn’t charge more just because you are a business. After all, business run on a budget too. We have worked on projects ranging from kiosk loops and presentations on DVD to documentaries and major motion pictures. Let our experienced team work for you too! Encore DVD Productions holds itself to client confidentiality. Rest assured that your vital information will not be disclosed. 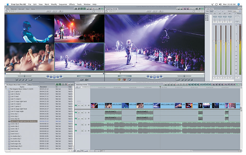 Encore DVD Productions is also equipped to author Hybrid DVDs, which combine both DVD-video and DVD-ROM data. Since most computers currently ship with DVD-ROM drives, you should consider distributing computer based content with your videos!